Available again in paperback, Golden Days is a major novel from one of the most provocative voices on the American literary scene. Linking the recent past with an imagined future, Carolyn See captures life in Los Angeles in the 70s and 80s. This marvelously imaginative, hilarious, and original work offers fresh insights into the way we were, the way we are, and the way we could end up. 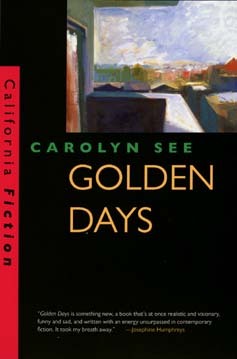 Carolyn See, the author of Dreaming: Hard Luck and Good Times in America (California, 1996) and five novels, is a book reviewer for The Washington Post and an adjunct professor of English at University of California, Los Angeles.